Looks great. Incredible soundtrack. A plot full of holes. A massive missed opportunity. That sums up Tron: Legacy. As a spectacle it is quite beautiful, once we enter the digital world, the tech blending with the actors seamlessly in a completely believable world of black and brilliant blue white light. Daft Punk's music pours over the scenery like audio gold, driving the movie forward in as a good a soundtrack as I've heard in years. The acting is ok, Jeff Bridge's does his bit as the grizzled boffin with the surf speak, but the rest, including Garrett Hedland as his son travelling to the virtual world to find his missing father, don't really capture your heart. It all just feels a bit soulless. We all live and breathe the digital world these days. 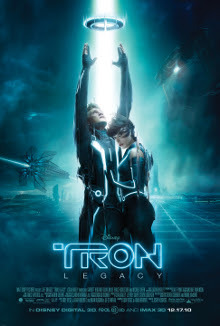 Tron: Legacy doesn't make us ponder anything about it. Instead it sits inside a closed system where the digital characters threaten to break out into our world seeking to make our chaos a perfect world, without us in it. Ohh exciting. Why not set it on the net? Our net? The one I'm using right now? And why on earth would a flying machine, in a digital world, hosted on a computer, in the cellar of an old arcade, stall mid flight? All that said there were moments of genuine excitement and pleasure. The light cycle sequence in particular works better than any fan of the original could have hoped for. All gorgeous graphics and spectacular digital death. I saw the sequence on a 3D TV and my jaw dropped a bit. Tron: Legacy is a must rent on BluRay, turn it up loud for the soundtrack, close the curtains to get the most out of the visuals, disengage brain.